Directions (1–5): Study the following information to answer the following questions: Twelve people are sitting in two parallel rows containing six people each, in such a way that there is an equal distance between adjacent persons. In row-1, P, Q, R, S, T and V are seated and all of them are facing south. In row-2, A, B, C, D, E and F are seated and all of them are facing north. Therefore, in the given seating arrangement each member seated in a row faces another member of the other row. A sits third to the right of D. Neither A nor D sits at extreme ends. T faces D. V does not face A an V does not sit at any of the extreme ends. V is not an immediate neighbor of T. B sits at one of the extreme ends. Only two people sit between B and E. E does not face V. Two persons sit between R and Q. R is not an immediate neighbour of T. C does not face V. P is not an immediate neighbor of R.
1. Who amongst the following sit at extreme ends of the rows ? Who amongs the following faces A ? How many persons are seated between T and S ? P is related to V in the same way as C is relate to F. With which of the following is E related by, following the same pattern ? F is not an immediate neighbor of A.
F sits third to the left of D.
Directions (6-10): Study the following information to answer the following questions. In a certain code, ‘her idea has merit‘ is written as ‘fo la bu na‘, ‘merit list has been displayed’ is written as ‘jo ke la si na’, ‘her name displayed there‘ is written as ‘ya si bu zo‘, and ‘name in merit list‘ is written as ‘na ya go ke‘. 6. What does ‘ke‘ stand for ? What is the code for ‘idea’ ? Which of the following represents ‘name has been displayed’ ? What does ‘zo’ stands for ? Which of the following may represent ‘her name is there’ ? Directions (16-20): In each of the questions below three statements are given followed by four conclusions numbered, I, II, III and IV. You have to take the given statements to be true even if they seem to be at variance with commonly known facts. Read all the conclusions and then decide which of the given conclusions logically follows from the given statements disregarding commonly known facts. a. Some dogs are rats. b. All rats are trees. c. Some trees are not dogs. IV. All trees are dogs. a. Some boys are rains. b. All rains are clouds. c. Some clouds are cars. I. Some clouds are boys. II. Some cars are boys. III. Some cars are rains. Statements : a. All bricks are flowers. b. Some houses are flowers. c. All pens are houses. Conclusions : I. Some houses are bricks. II. Some pens are flowers. III. Some flowers are bricks. IV. No pen is flower. Statements : a. All lions are ducks. b. No duck is a horse. c. All horses are fruits. Conclusions : I. No lion is a horse II. Some fruits are horse. III. Some ducks are lions. IV. Some lions are horses. Statements : a. Some mountains are rivers. b. Some rivers are roads. c. Some roads are windows. Conclusions : I. Some windows are roads. II. Some rivers are mountains. III. Some roads are mountains. IV. Some windows are rivers. Directions (21-25): Study the following information to answer the questions given below : A number arrangement machine when given an input of numbers, rearranges them following a particular rule in each step. The following is an illustration of input and steps of rearrangment. 21. What will the fourth step for an input whose second step is given below ? What should be the third step of the following input ? What should be the last step of the following input ? If the first step of an input is “785 198 32 426 373 96 49” then which of the following steps will be “785 32 426 49 198 373 96” ? Give answer (2) if the data in statement II alone are sufficient to answer the question, while the data in statement I alone are not sufficient answer the question. Give answer (4) if the data even in both statements I and II together are not sufficient to answer the question. 26. Which bag amongst P, Q, R, S and T is the heaviest? I. Bag Q is heavier than bag R and bag S. Bag T is heavier than bag P only. II. Only three bags are lighter than R. The weight of bag Q is 50 kg which is 2 kg more than bag R.
Are all the five friends viz. A, B, C, D and E who are seated around a circular table facing the centre? I. A sits third to the left of B. B faces the centre. D and E are immediate neighbours of each other. C sits second to right of E.
II. D sits second to the right of C. C faces the centre. Both E and A are immediate neighbours of D. B sits second to right of A. In a college five different subjects, viz. Physics, Chemistry, Botany, Zoology and Mathematics are taught on five different days of the same week, starting from Monday and ending on Friday. Is Chemistry taught on Wednesday ? I. Two subjects are taught between Zoology and Mathematics. Mathematics is taught before Zoology. Chemistry is taught on the day next to the day when Physics is taught. Botany is not taught on Friday. II. Three lectures are scheduled between the lectures of Botany and Zoology. Mathematics is taught immediately before Physics. Is the time in the clock 9 O’clock now ? I. After half an hour, the minute and the hour hands of the clock will make an angle of exactly 90° with each other. II. Exactly 15 minutes back, the hour and the minute’s hand of the clock coincided with each other. Is F the granddaughter of B ? I. B is the father of M. M is the sister of T. T is the mother of F.
II. S is the son of F. V is the daughter of F. R is the brother of T.
Directions (31–35): Read the following information carefully and answer the questions given below: P, Q, R, S, T, V and Z are seven employees of a call centre. They work in three shifts—I, II and III. There is at least one and not more than three among in any of these shifts. Each of them get one day off every week from Monday to Sunday. Q works with only T in shift II and his weekly off is immediate to the next of the off day of P. S has weekly off on Sunday and he is not in the same shift with either R or Q. P is in shift I with R whose off day is immediately after Q and immediately before T. V’s off day is immediately after T but not on Saturday. The employee having off day on Friday works in shift III and that on a Saturday does not work with T. Z does not work either in shift II or shift III. 31. In which shift do three of them work ? On which day of the week does Q have off day ? Which of the following combinations of employee-off day-shift is not correct ? Who among them has off day immediately on the next of V’s off day ? In which shift does V work ? Directions (36–40): In each question below is given a statement followed by three assumptions numbered I, II and III. An assumption is something supposed or taken for granted. You have to consider the statement and the following assumptions and decide which of the assumptions is implicit in the statement. 36. Statement: Large number of people affected by the flood in the area gathered at the relief camp for food, water and shelter organized by the state government. I. The relief camp has enough supplies to provide food and water to affected people in the area. II. All those whose houses are submerged can be accommodated in the temporary shelters. III. Many more affected people are yet to reach the relief camp. Statement: “If you desire to enjoy the best holidays to Europe, join our exclusive EURO package”. An advertisement of a travel agency in an Indian newspaper. Assumptions: I. Many Indians travel to European countries to spend their holidays. II. There are other travel agencies in India which organize holiday tours to Europe. III. Many people may still travel to Europe through other travel agencies. Statement: “If you are a first class graduate with at least 65 per cent marks, you are eligible to apply for the post of officer in our organization”. An advertisement for recruitment of officers. Assumptions: I. There may be adequate number of applicants who will fulfil the stipulated educational qualification. II. Those graduate who have secured less than 65 percent marks may not perform well in the job. III. Those candidates who have secured 65 percent or more marks in graduation are likely to perform well on the job. Statement: The government has decided to hike the prices of petrol and diesel by about ` 3 per litre to partially reduce the gap between the domestic and international prices. Assumptions: I. The oil companies may not be able to absorb the deficit in purchase and sale price. II. People may start countrywide agitation against the price hike. III. The oil companies may not agree to the government’s decision of marginal price hike. Statement: The Government has decided to allow the shopping complexes to remain open till midnight to reduce crowding of shoppers in these complexes during the weekends. Assumptions: I. People may still prefer to shop during the weekends. II. Many people may now do their shopping leisurely during the late evening hours. III. The sales of these shopping complexes may increase generating revenue for the Govt. Directions (41–45): Read the instructions carefully and answer the following questions. A, B, C, D, E, F, G and H are eight students of a school. They study in Standard VI, VII and VIII with not more than three student in any standard. Each of them has a favourite subject from Physics, Geography, English, Marathi, Mathematics, Chemistry, Biology and Economics not necessarily in the same order. D likes Chemistry and studies in Standard VIII with only H. B does not study in Standard VII. E and A study in the same Standard but not with B. C and F study in the same Standard. Those who study in Standard VI do not like Mathematics or Biology. F likes Physics. The one who studies in Standard VIII likes English. C does not like Geography. A’s favourite subject is Marathi and G does not like Biology. 41. Which subject does H like ? What is G’s favourite subject ? What is C’s favourite subject ? Which of the following combinations of student-Standard Subject is correct ? Which of the following groups of students read in Standard VII ? Directions (46-50): In making decisions about important questions, it is desirable to be able to distinguish between “Strong” arguments and “Weak” arguments in so far “Strong” arguments are those which are both important and directly related to the question. “Weak” arguments are those which are of less importance and also may not be directly related to the question or may be related to a trivial aspect of the question. Instructions: Each question below is followed by two arguments numbered I and II. You have to decide which of the argument is a strong argument and which is a weak argument. 46. Statement: Should government privatize the established higher level Institutes of Technology (IITs)? Arguments: I. Yes, privatization will make these institutes financially healthy, competitive and quality-conscious. II. Yes, privatization is the key of the new era – can we survive without it? Statement: Should vacations of judges be reduced? Arguments: I. Yes, it will speed up judicial process and many people are likely to get justice in reasonable time. Statement: Should the practice of transfer of clerical cadre employees from one city to another government office be stopped? Arguments: I. No, transfer of employees is a routine administrative matter and we must continue it. II. Yes, it involves a lot of governmental expenditure and inconvenience to many compared to the benefits it yields. Statement: Should higher qualification be the only criteria for internal promotions in any organisation? Arguments: I. Yes, why not? In fact only higher qualification is more important than other factors. Statement: Should Indian scientists working abroad be called back to India? Arguments: I. Yes, they must serve the motherland first and forget about discoveries, honors, facilities and all. 51. The difference between the white-coloured cars sold in the two metros of which of the following models is minimum ? The total number of blue-coloured cars of Model E and D sold in Metro H is exactly equal to the number of white-coloured cars of which model in Metro M ? 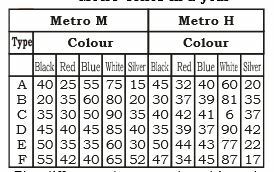 What is the difference between the number of blue-colour cars of model ‘C’ sold in Metro M and number of blue colour cars of model ‘F’ sold in Metro H ? The total number of silver-coloured cars sold in Metro H is approximately what percentage of that in Metro M ? In Metro M the number of cars sold was maximum for which of the colour-model combinations ? 56. What was the total expenditure on Accounts department ? What was per employee expenditure on medical ? What was the total expenditure on salary of employees in Marketing department ? What was the amount spent on electricity ? 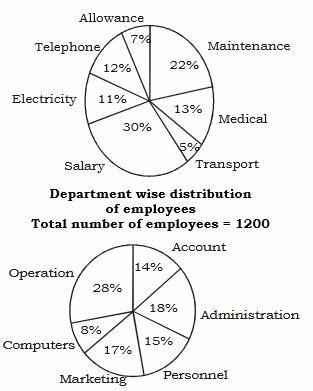 What was the expenditure on telephone for employees in computer department ? 61. The population of villages A as well as B is increased by 10% from the year 1995 to 1996. If the population of village A in 1995 was 5000 and the percentage of population below poverty line in 1996 remains same as in 1995, find approximately the population of village B below poverty line in 1996. If in 1997 the population of village D is increased by 10% and the population of village G is reduced by 5% in 1995 and the population of village G in 1995 was 9000, what is the total population of villages D and G in 1997 ? If in 1995 the total population of the seven villages together was 55,000 approximately, what will be population of village F in that year below poverty line ? 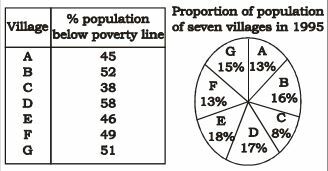 If the population of village C below poverty line in 1995 was 1520, what was the population of village F in 1995 ? The population of village C is 2000 in 1995. What will be the ratio of population of village C below poverty line to that of the village E below poverty line in that year ? What is the total number of boys in School T ? The total number of students in school R, is approximately what percent of the total number of students in school S ? What is the average number of boys in schools P and Q together ? 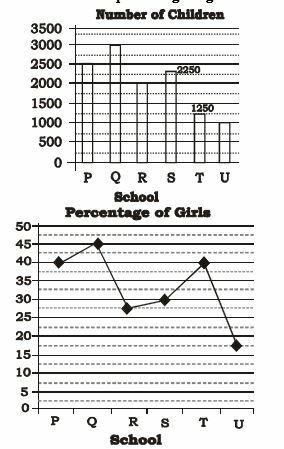 What is the respective ratio of the number of girls in school P to the number of girls in school Q ? 71. What is the average number of people using mobile service M for all the years together ? Number of people using mobile service N in the year 2006 forms approximately what percent of the total number of people using all the three mobile services in that year ? 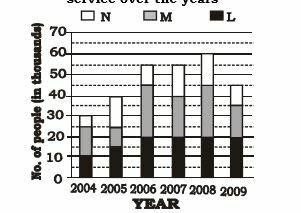 What is the respective ratio of number of people using mobile service L in the year 2005 to those using the same service in the year 2004 ? What is the total number of people using mobile service M in the years 2008 and 2009 together ? 76. In which of the following years was the amount of profit the maximum ? Approximately what was the average expenditure of the given years ? In which of the following years was the increase /decrease in percent profit from the previous year the minimum ? Approximately what was the expenditure in 1994 ? If the profit percentage in 1997 was 25, what would have been the expenditure in that year ? Directions (81-85): Study the following table carefully and answer the questions given below it. The number of candidates appeared, passed and selected in a competitive examination from five states over the year. In the year 1995, which state had the lowest percentage of candidates selected over the candidates appeared ? During which of the following years the passing percentage over appeared is the highest from state D ? Total number of candidates selected from state A is approximately what percentage of the total number of candidates selected from state B ? During which of the following years the percentage of candidates selected over passed is the lowest for state B ? What is the ratio between number of candidates passed from state A in 1996 to that from state E in 1999 ? 86. In which train is the number of passengers travelled the maximum during the eight years? If the fare of Shatabdi Exp is ` 400 for all classes of pasengers and the fare of Sampark Kranti Exp is 20% more than that of Shatabdi exp, then what is the ratio of the income of Shatabdi Exp in 2012 to that of Sampark Kranti Exp in 2013? 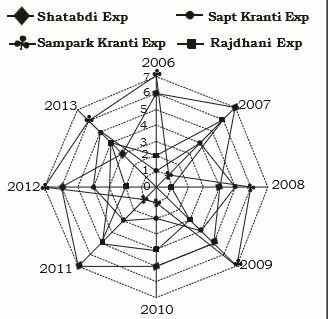 What is the difference between the number of passengers of Sapt Kranti Exp in 2011 and that of Rajdhani Exp in 2006? 89. The total number of passengers in 2010 is what percent of the total number of passengers in 2013? If the fare of Rajdhani Exp is Rs. 350 and that of Sapt Kranti Exp is Rs. 450 for all classes of passengers then what is the total income of both the trains from 2011 to 2013? In which month is the average price of onion per kg the minimum? In which city is the average price of onion per kg the maximum during the given six months? 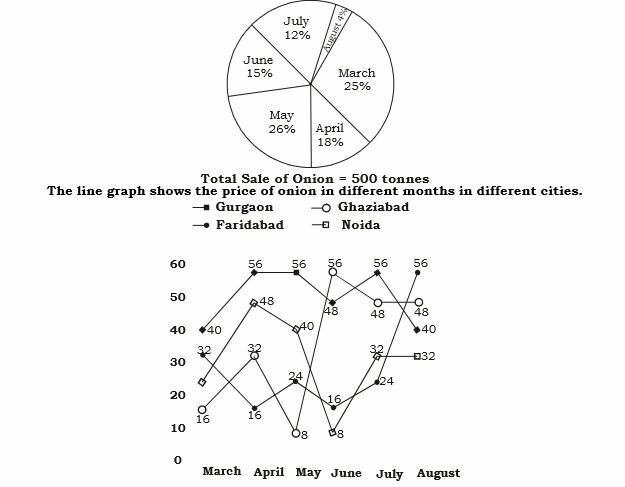 If the quantity of onion sold is the same for all the cities, then what is the difference between the total income from the sale of onion in June and that in July? If 35% of the total sale of onion in March is from Faridabad, then what is its total income? The price of onion in Gurgaon in April is what percent of the price of onion in Noida in May? 96. 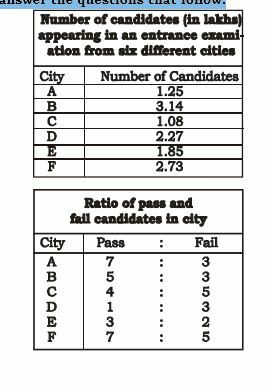 What is the respective ratio of the number of candidates failing in the exam from City D to those failing in the exam from City A ? Which city has the highest number of failed students in the entrance exam ? What is the number of passed candidates in the exam from city E ?